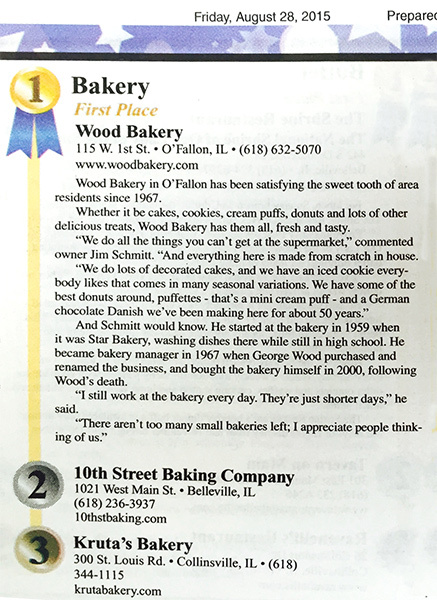 Wood Bakery has been a mainstay in O’Fallon Illinois since 1967. Jim and Barbara Schmitt have owned the business since 2000, but are no strangers to the bakery business. Jim has been manager of the bakery since the doors opened in 1967. Barbara has worked at the business for over 35 years. They take great pride in being owners of such a wonderful O’Fallon tradition. We provide our customers with a superior product at an affordable price. Only the finest ingredients go into each and every product. Whether you’re in search of the perfect wedding cake, pie, pastry, cookie or muffin, we have the fare for the most discriminating tastes. Click here and read about Wood Bakery winning the prestigious Heritage Award!